The Grammy’s were this past Sunday on CBS and everyone tuned in to watch multiple artists like Lady Gaga, Post Malone and Cardi B perform live, as well as see which of their favorite artists won an award. One of the awards a lot of people were looking forward to see was the Best Rap Album. As you can tell from the title of this post, Cardi B won for her album “Invasion of Privacy” which this year has topped the music charts with tracks like Bodak Yellow, Ring (ft. Kehlani), and I Like It. Cardi B emotionally accepting her first ever Grammy. This award was very important to Cardi. Due to the fact that it was her first Grammy win and that she is the first woman to ever win the award. I find this extremely important in today’s day and age, because news like this uplifts and empowers women. The award Cardi won tonight, just proves that with a little hard work and dedication, dreams do come true. Cardi B started off as a stripper, and she worked hard to make music and be taken seriously as an artist. On top of that she maintains her authentic personality which all of her fans admire. Not to mention while she was working hard to climb the charts, she was also expecting her first born child. This woman achieved her dreams and goals with all the hard work and effort she put into her music. I can’t wait to see where her career takes her next. Chuck E. Cheese SUING Youtuber Shane Dawson?? The rapper booked it to the desert after the event for a surprise Coachella appearance. 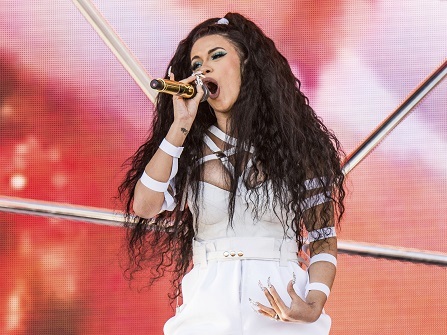 Cardi B is the leading contender at the 2019 Billboard Music Awards with 21 nominations. Cardi B was so overwhelmed that her debut album ‘Invasion of Privacy’ won the Grammy for ‘Best Rap Album,’ she could barely speak! Watch her touching speech here, sprinkled with her trademark jokes.